Pre - algebra and algebra ii worksheets for children from 3rd to 7th grades. Be introduced to basic algebra concepts like algebraic expressions, finding unknown variables in addition, subtraction & division equations, simultaneous equations, binary expressions, Pythagorean theorem, finding angles, quadratic equations, order of operations and more. Each worksheet is a PDF printable document that can be downloaded at all times. These materials are useful extra practice resources for parents and teachers of kids in primary school. 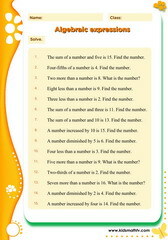 Get more algebra practice and don't forget to play relavant games on this site. 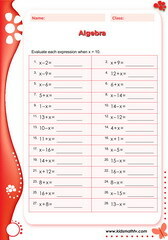 Practice Algebraic expressions with this worksheet. Practice Equations with defined variable with this worksheet. 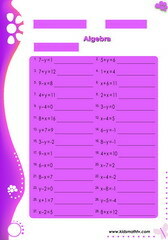 Practice Pre-algebra with this worksheet. Practice Solve for variables with this worksheet. 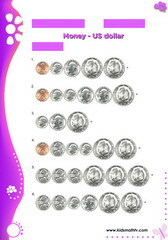 Practice Add coins usd with this worksheet. 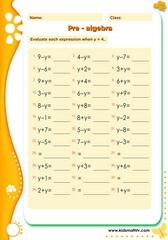 Practice Algebra evaluating expressions with this worksheet. Practice Algebra number problems with this worksheet. 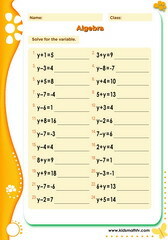 Practice Algebra solving for the variable with this worksheet. Practice Money buying with this worksheet. Practice Pre algebra addition equations with this worksheet. Practice Pre algebra equations with this worksheet. 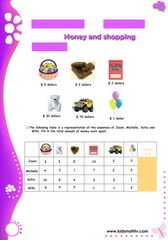 Practice Shopping with this worksheet.